There is already a distinct of otherness about Tommi Grayson, way before the transformative (literal and otherwise) experiences of Who’s Afraid?, the impressive debut novel by Maria Lewis, take hold. Hers is clearly an identity forged in the fires of exclusion, of not quite fitting in growing up, of marching to the beat of a drum so different and outside the norm that not even she is quite sure what it sounds like exactly. All she knows is that she is different, boundaries ill-defined, and it finds vibrant expression in her electric-blue hair, her eclectic fashion choices, her burgeoning career as a curator of art exhibitions, her near-lifelong practising of Muay Thai and her jaunty, oneliner-heavy ability to speak her mind. Her expression of this sense of self, which Who’s Afraid? reveals to be known and unknown all at once, is worn defiantly; not militantly or aggressively but simply expressed with the strong assurance of someone who long ago accepted she was not going to slip nicely and neatly into the mainstream and set about defending who she was against those who thought she should. It’s this assured sense of self that leaves her at least somewhat prepared for the profoundly disruptive revelations she encounters; given the fantastical nature of these revelations, which lie well outside anyone’s normal life experiences, save for those who inhabit this otherworldly place that lies within and around our own, there is no way she can be wholly prepared, and she most certainly isn’t. Lewis captures Tommi’s sense of dislocation perfectly, adroitly describing the kind of deeply unsettling change that results when something unknowable about yourself, that lies just out of range and focus, suddenly snaps into view and you know without a shadow of doubt who you are and why you do the things you do. In one sense it’s welcome since you truly know who and what you are, but as Tommi discovers it can also prove destructive to everything you’ve known up to that point. This seismic upsetting of Tommi’s applecart, which follows a trip to Rotorua, New Zealand to see if she can find out anything more about the Maori father she never knew after her mother fled the country for an obscure life in Dundee, Scotland, is rendered graphically and yet knowingly, the slow tipping from fear and uncertainty to the sense that everything is about to change dramatically rendered in ways that leave you gasping for breath almost as much as Tommi. 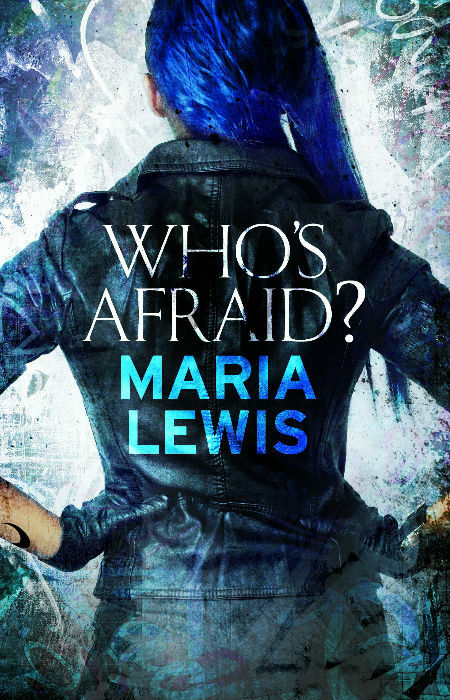 Lewis has managed the seemingly impossible with Who’s Afraid?, balancing the everyday and the supernatural, the day-to-day world of going to work, paying bills and nights on the town with close friends with revelations that there is far more out there for Tommi than she might have dared imagine. The world building is so well done it almost seems to be spring fully-formed from the page – Dundee Scotland and Tommi’s life there comes effortlessly alive in all its glory almost immediately, leaving you feeling as if you have known her and her close friends Mari, Kane and Joss for years, not simply pages. So too does the new world she encounters, one represented by Lorcan who seems to know more and have seen more than his 27 years on this world could possibly have allowed for. Lewis has clearly put a great deal of thought into who Tommi and all the characters are, the kinds of lives they lead and the worlds they inhabit, so much so that everything is richly alive from the word go. Having places and people so well-realised means that you care about what happens to them deeply; unlike some urban fantasy novels where the characters are sketched in just enough to keep the narrative galloping merrily along, Who’s Afraid? takes the time to make everything matter so that the narrative is propelled by the characters, rather than leaving them hanging on grimly for the ride. Defining the characters so well also means that many of the relational twists and turns that fill the book don’t impede the story but add richness and vitality to it; they are, in effect vital elements of it and you never for a second feel as if this conversation or that heartfelt moment is holding things up at all. In fact were they not there, the book would be poorer for it. Lewis also displays a strong grasp of writing the more action-oriented scenes too. So intensely and viscerally written are they, and so invested with the emotional responses of the participants, that you feel every muscle flex, every blow land, every fatal strike do its life-ending damage. There is a strong sense that you are in the mix with these people, particularly Tommi, whose every breath, rush of blood and adrenaline-fuelled move is felt in every bone-crunching, soul-crushing detail. It’s a rare thing indeed for any writer to be as adept at writing intimate character moments as large scale action tableaus but Lewis does both beautifully, investing Who’s Afraid? with an immersive, well-rounded feel. You never feel at any point like you’re waiting for a particular scene to be over so you can move onto something better; every word, every scene, every crisply-written sparkling line of dialogue (which is all of it; the dialogue, as with so much of this book, is uniformly good) matters, and you want to savour it all, every last step of Tommi’s unexpected, fantastical journey, regardless of where it takes her. And Who’s Afraid? takes you to some amazing places, both around the world and within Tommi herself, in a brilliantly well-told tale of what happens when that sneaking sense that there’s more to you and your world than is immediately obvious comes graphically into play, and you’re left with the choice to either run with it or fall beneath its oncoming might, come what may.